It’s just a game. In the grand scheme of things, it’s inconsequential. But that doesn’t make it hurt any less. It doesn’t make sense that they’re bad. They have a good squad with good players, and, as reluctant as I am to admit it, a good manager. They have one of the most talented players in MLS in Alphonso Davies, a solid and skilled midfield, and for the most part a quality defence. They shouldn’t have lost Sunday. They lost to a team far worse than them, on a goal that was the result of an unlucky deflection, and peppered the Colorado goal to no avail. By all statistical analysis, they should have beaten the Rapids. They didn’t. The week before, they lost 4-0 to a Union side that certainly wasn’t better than the Whitecaps on paper. Something is wrong here. Nevertheless, we go again. For the time being, the Whitecaps are miraculously holding down the final playoff spot in the West. That spot is anything but secure – the Dynamo are a point behind with two games in hand, and the Galaxy are level on points with the Houston club having played one more game than them. After the previous two performances, I don’t see this team doing anything of note this season, but fortunes can change in the blink of an eye in this league. 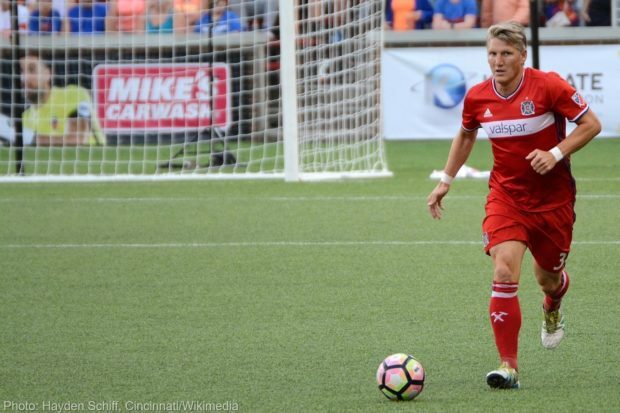 On Saturday evening, after all the semi-finals of the World Cup are set , they have the chance to kickstart those fortunes when Chicago Fire come to town. What Whitecaps will they face, both in terms of personnel and performance? Cristian Techera is still suspended for use of inappropriate language, and will not play. First-choice goalkeeper Stefan Marinovic has returned to full training and while I’m hopeful that he will start, I’m also doubtful, and Brian Rowe is more likely to get the nod. Kendall Waston looked to struggle in his return from the World Cup, just four days after Costa Rica’s final match. He seems to have picked up a knock, and the pairing of Doneil Henry and Jose Aja seems likely, as Aaron Maund seems to have fallen out of favour with the gaffer. Marcel de Jong seems to be the definitive first-choice left back now, with Brett Levis having failed to get into a match in over a month. Jake Nerwinski is likely to partner with him, but Sean Franklin is always an option on the right side. The line-up for the most part is set past that point – Yordy Reyna and Kei Kamara as the main forwards, with Davies and Brek Shea as wide midfielders that can transition to wingers when going forward. Centrally, Felipe has become a mainstay and one of the most consistent Whitecaps, but his partner in the middle of the midfield is up in the air – Jordon Mutch has impressed as of late and would be my pick, but Efrain Juarez and Russell Teibert are also available. But the starting XI, for the most part, has found a comfortable place. And while I must reiterate here that the Whitecaps are bad, I actually like this line-up. I like all these players, I don’t think there’s a real hole or vulnerability anywhere in the roster. Again, it doesn’t make sense that they’re bad. Maybe, just maybe, they won’t be terrible this week. Chicago’s injury list is terrifying – eight men are listed as being hurt, with six confirmed out for the upcoming match and two listed as questionable. But most of the Fire’s key pieces are available for selection, like Aleksandar Katai, Bastian Schweinsteiger, and Nemanja Nikolic. Chicago Fire have the exact same record as Vancouver, and like the Whitecaps are hanging on for dear life to the final playoff spot in their conference. Somehow, the general feeling around the league (at least from what I’ve gathered on social media) is that the Fire are in a position to keep winning games and make some noise in the postseason if they can get there – while the Whitecaps, in the exact same position, are seen as a lost cause. I know, I’ve said that I feel that way myself, but it doesn’t quite seem fair – if them, why not us? In my mind the ‘Caps are a more complete side, and I’m thinking back to just three matches ago when Davies singlehandedly decimated Orlando City. I’m doubtful that they can find that level again, but when the Whitecaps put five past the Lions, I was reminded of standing in the Southside last fall when Vancouver tore San Jose Earthquakes to shreds and advanced to face Seattle in the playoffs. On that night, I believed. I’m not quite at the point where I can believe anymore, at least not for this season – but there’s some small voice inside that says this might not be over just yet.